Once a vendor has been set as a T508 recipient, the user can generate T5018s when they are due. The T5018s are generated for the year before the date set in Company Settings -> Payroll -> Contractor-> Reporting Period Ending. Go to the top menu “Payroll” and select T5018. To add last years T4As for processing click the “Generate T5018” button. Once the T5018s are generated, they can be edited for corrections and additions. 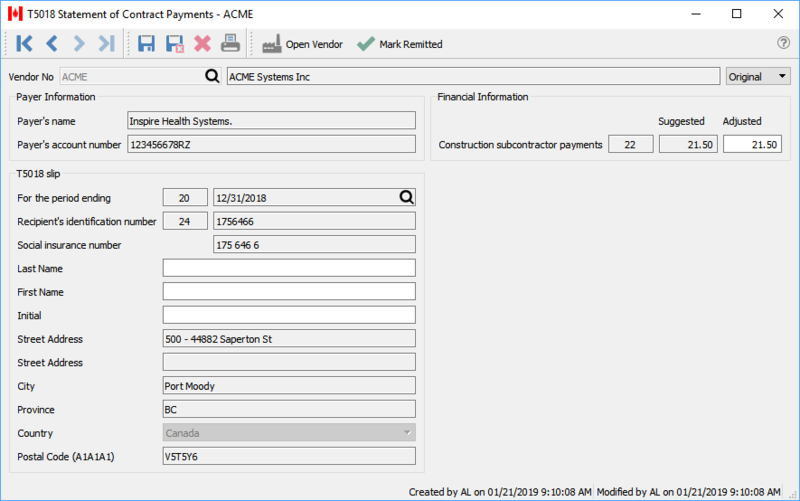 Contact names must be entered manually, Spire enters the full amounts including HST/GST that were entered in accounts payable from the previous year. into box 22. All other boxes need to be filled in manually if required.